I took a deep breath of the thin 5,500m (18,000 ft) air, scanned the beautiful scene of jagged rocks, sparkling white snow and deep blue glacier ice around me and slowly became more comfortable in my thought that we would not reach the peak. This is always a hard decision for any climber to make but when it’s the right thing to do, pushing against it can lead to very uncomfortable and sometimes disastrous situations. Rob, Dave and I, had just hauled our heavy mountaineering equipment – ice axes, crampons, helmets, ropes, harnesses and such – up from our advanced camp to stash them where we would need them higher on the mountain. This is where we would transition from the rocky scree slope onto the ice sometime in the dark wee hours of the next morning. Getting to this point had involved months of dreaming, weeks of planning, days of acclimatizing and trekking and finally, hours of hauling gear to the upper mountain. The trek to the base of Ausangate, a 6,300m peak deep in the Peruvian Andes, is a beautiful 5-6 day circuit in it’s own right and I highly recommend it for those who are looking for a less technical way of experiencing the Andes. Part of our acclimatization regime for this climb included a nice little climb up a 5,500m peak called Campa, which is along the way on the trek to the base of Ausangate. After two days of trekking under clear blue skies (though, the clouds would crowd the summit of Ausangate each afternoon. We watched this very closely!) we established camp as close to Campa as we could and scouted the route through binoculars that afternoon to have a feel of what we would be on in the dark early the next morning. Jose, our awesome cook for this trek gave us a very tasty early dinner and we hit the sack just after dark. We woke well before sunrise, around 1am. Jose delivered hot drinks to our tents and had porridge and other snacks ready for us when we stumbled into the mess tent. The air was cool as we strapped on our packs. Socra, our trekking guide, not a climbing guide, had trekked past Campa many times before but had never been up on the mountain. Not knowing how technical it would be, we didn’t know if he would be able to join us to the summit in just a pair of hiking boots. Undaunted, he was keen to come and we were glad to have him along. For the first hour, the view was the same as it always is in the dark on a mountain. A small circle of light dances in front of you from your headlamp and the vast depths of space and stars hover above. As I’m prone to do, I switched off my headlamp and let my eyes adjust to enjoy the dark landscape we were passing through. We transferred from the relatively benign trail and started our way up the side of the mountain just before the eastern sky alluded to the coming sun. There were cairns sparsely set along the way and the footing was loose and tricky. It’s always a magical time to be on the side of a mountain as the sky begins to glow and it transforms the mystical dark shapes around you. Because we’re well above timberline and among a bunch of rocks, the terrain goes from a jagged silhouette to a monochrome environment and finally there is enough light to discern the subtle nuance of color and shading on the rocks. But, of greater draw of attention is cresting a ridge and looking west to where the early beams have splashed their deep orange color upon the surrounding higher snowy peaks. This is one of the most beautiful things in the world. It demands a moment of pause to absorb the beauty framed by the morning sky, the distances visible through the peaks and the lesser ridges and summits still in the shadow of the earth patiently awaiting their turn to be bathed in light. The rock ended and we skirted our way along the rim of the glacier hanging from the mountain above us. It was a steep wall of ice and when we reached a deep ravine where the choice was to drop down into the ravine to continue to look for a gentler slope to get up onto the snow or to get out the ice climbing gear and start to claw our way up the white stuff. We opted for the latter and it seemed this is where we would have to leave Socra behind. As we strapped on our hardware and set up our ropes and belay system, Socra opted to continue to explore. The sun beams had just crested the far ridge above us and we celebrated the direct light with a snack then proceeded to spend half an hour hacking away at the ice only to decide it was a pretty crummy place to climb. A small dark speck, moving across the white slope further around the mountain, at about the same elevation as us was quickly identified as Socra whose exploring had paid off and he, without crampons or an ice axe, was able to transition onto the snow and continue up the mountain. Humbled, though still happy that we got the climbing kit out and explored our option to its end, we packed up our gear and continued down into the rocky ravine and back up to the gentle snow slope where we saw Socra. Thanks to Socra’s example, we clearly didn’t need the technical hardware we had brought at this point. 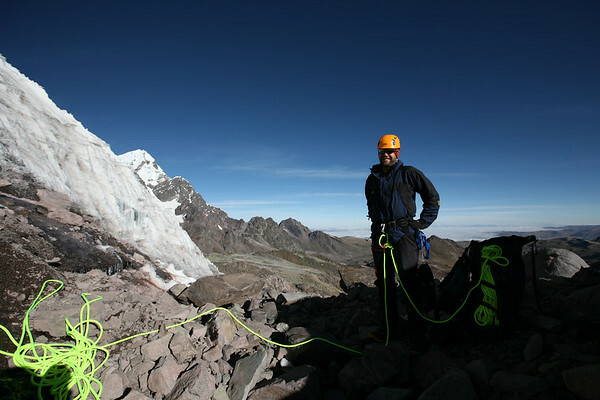 But along with acclimatizing, this was also a great opportunity to rope up and to travel as a rope team to get any unforeseen bugs out of the system before we got up on Ausangate. This proved to be very useful for each of us. I had some problems with my rented crampons that only strapping them on and walking around in them would have revealed. Not something I would want to deal with in the early morning in the dark on the ice at 5,800m. The sun continued to rise and we continued to climb on the steep snow. It worked out well for Socra that the slope we ascended was heavily sun-cupped. This practically gave him snow steps to walk up without having to kick his own into the still frozen, though softening, slope and risking a long slippery slide down to the jagged rocks below. Though traveling as a rope team is very safe, it’s also very slow. Satisfied and comfortable with how we were moving as a team we ditched the rope and harnesses on a small plateau before making a push to the summit. Where, by the way, we saw and waived to Socra who was looking very happy with himself to have made it. And rightfully so. Soon, all four of us were together under sunny skies at 5,500m on the top of Campa enjoying the thrill of accomplishment and the phenomenal views. Everybody was feeling really good. Our acclimatization schedule had worked well, especially for Robert and me as we were living practically at Sea Level only a week ago. Going down was incident free. While we were on the mountain, Martin, who organized the trip, and the crew packed up camp (after going back to bed once they saw us off at 2am) and moved camp to the other side of Campa, putting us further along our way to Ausangate. Martin was waiting for us on the trail where we came off the far side of the mountain and walked with us the few kilometers down to camp already set up and Jose with food on the stove ready to replenish our hungry, post-summit bodies. After a big climb day, we made it to bed early again and had a good rest to make a normal start the next morning where we would work our way around to the far side of Ausangate and establish our base camp at 4,800m by lunch time. After pouring all of our gear out on to a big tarp, we sorted it and loaded up the horses to take us as far as they could., Martin, Socra, Jose and Pablo (our horse man) all came along and once we reached a point where the horses could no longer climb with us, we transfered the gear to the two-legged mules and started to hoof it up the steep, at times snow-sprinkled, slope to establish our advanced camp at 5,100m. Martin and the boys dropped off their bags and headed back down the hill while Dave, Rob and I started to set up camp and made a plan for the next day. We stumbled through having to cook for ourselves again and simply had a “just add water” chicken soup and some bread. 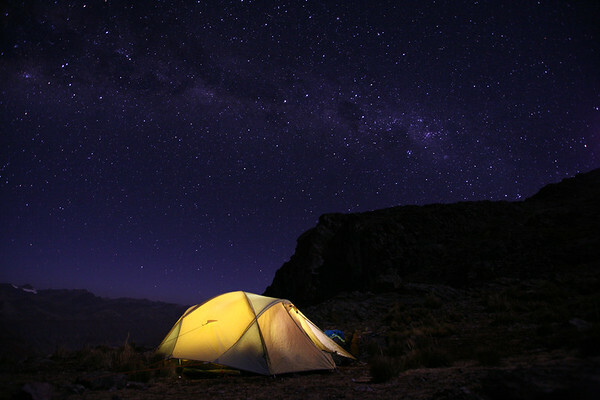 Again what looked like a million stars sprawled out over us (although, astronomers say there are only 6,000 that can be seen with the naked eye) and we squeezed ourselves into Dave’s very small pup tent. I managed to sleep pretty well, but Dave and Rob later shared the night was long and fitful for them. We were plenty warm all crammed into the small tent, and just as the sky lightened a shade from pitch black Dave moved out of the tent and slept past sunrise. I was ready to explore and wandered up onto the moraine deposits looking for photographic opportunities and watching the sun rise. Just as I returned, Dave was starting to stir and he took a walk while I delved into my journal until Rob came to and we got some breakfast going. It was at this breakfast meeting that we discussed the options of moving our entire camp up another hundred meters to sleep closer to the ice apron where we would start climbing up the glacier or to just haul our heavy gear up, stage it and come back down to sleep low and carry light packs in the morning. We reached the 5,400m mark just past noon. I had just come back from the ridge where I radioed Martin and said all was well and scheduled a 5pm radio rendezvous. Rob and Dave were talking about the climb to come in the morning. Dave, who had a bit of a hit to his system while we were acclimatizing in Machu Picchu, said he was exhausted. This was uncharacteristic for Dave given his physical fitness, previous mountaineering experience and the extensive planning he had put into organizing this climb. Rob was on the mend himself, and mostly recovered, from an extensive involuntary purge of anything he ate. So, with two of our three team members well short of 100 percent, the 200 meter ice headwall that stood between us and the 6,300m peak of Ausangate did not seem like a smart thing to attempt. We opted to drop our packs and climb another 100m to see how it felt and it didn’t feel good. The signal, though unwanted, was clear. We had to call off the climb. This is where I discovered what I liked best about climbing with these guys. Everybody remained calm even amidst our disappointment. We consoled one another by sharing our gratitude for everything we had accomplished so far, for the views around us, the experiences and camaraderie together and the memories formed. We humbly admitted that a climb of this magnitude was going to be a challenge even if we were all in tip-top shape and potentially more trouble than we wanted in the condition we were now in. We took a moment to remember how we felt at this moment, at 5,500m on the glistening white glacier snow because as soon as we got lower, the air would thicken up and we will start to feel better and begin to wonder why we’re not higher up on the mountain. I couldn’t hail Martin on the radio to get some help to pull our gear off of the mountain. So, once we struck camp we all doubled up on our loads and slowly made our way back down to the valley. The base camp crew was surprised to see us that night and Jose got right on making a big dinner. Sure enough, we started to feel much better and dreamed about being back on the upper slopes. Since we were back a day early, we had time to continue around the long way to complete the beautiful Ausangate Circuit. Back in Pachchanta, soaking in the hot springs we watched the evening glow of the sun reflecting off the snow of Ausangate. Of course we still wished we had made it to the summit, but we all knew we made the right decision. We also started planning our return trip to Peru. 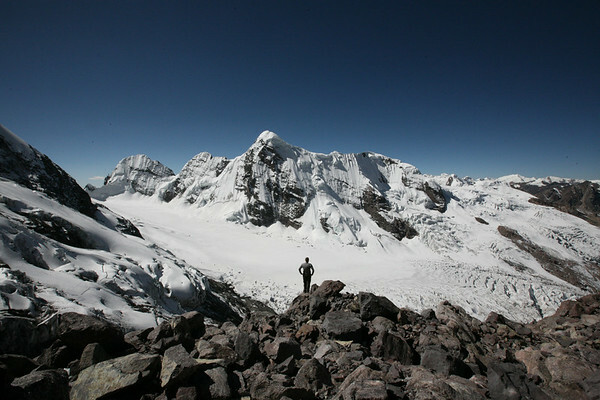 This entry is filed under: Climb, Earth, Hike, Photography, South America, Story, Video.